Good morning, everybody! Here is hoping you are all doing well. 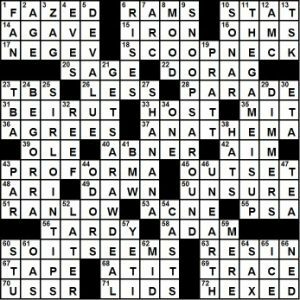 Let me be the last person on here to mention the wonderful time that was had at the American Crossword Puzzle Tournament that took place over the weekend in Stamford, Conn. Honestly, my work schedule during the time of ACPT — specifically, covering March Madness (NCAA Men’s/Women’s Basketball Tournament) on location at one of the host cities — should have precluded me from going to Stamford in five of the last six years at least. This past weekend marked my eighth consecutive year of being in Stamford for the event. That’s how magical ACPT is, with the biggest allure being the wonderful, like-minded, truly caring people you get to meet, whether you’re catching up with someone you know or meeting someone for the first time who will sure become a lifelong friend to you! Also, if you’re a hugger, this place is one of the best to give/receive them, a sign of how genuine almost everyone is to see you and to welcome you to a community with love and black-and-white squares as the foundation. It’s obvious that coming to the NYC area, depending on where you are as you read this, is expensive and can make it hard to ever be a part of this event, regardless of other factors in one’s life. But if you have not attended an ACPT before, try your best in making it out here if you are willing and able to one of these years. Over 200 rookies did so this year, with the only downside to that being that my middle-of-the-pack “E” division solving speed only looks worse in the final standings! The hugs, amazing puzzles and even more amazing people surely make up for that! Oh, we have a puzzle to talk about today! Today’s offering from Liz takes common words/phrases and changes the “p”-sounding syllable in it into an “f”-sounding syllable, thereby creating some pun-filled goodness in the grid. GRIM REEFER (16A: [Ghastly cigarette that has gone to pot?]) – Grim Reaper. CHIEF TRICKS (10D: [Shenanigans from a firehouse bigwig?]) – Cheap tricks. If you don’t have Cheap Trick’s “I Want You to Want Me” in your head right now, lucky you! It’s now stuck in my head. LEIF OF FAITH (25D: [Erikson the Believer?]) – Leap of faith. BOOK KEIFER (62A: [Hire Mr. Sutherland?]) – Bookkeeper. Definitely liked the Middle Eastern flavor in the middle of the grid, with KILIM (30D: [Middle Eastern rug]) and FARSI (46D: [Language of Iran]). I’ve never personally made a dish with SAFFRON before, but the times that I’ve had saffron rice has been beyond delectable and is making me curious to buy it and use it in a home-cooked meal in the future (52A: [Paella spice]). Loved the fill of MALARKEY, especially since I use that word in regular conversation more than probably all other 30-somethings in the state of New York combined (50A: [Balderdash]). Liked the intersection of TASTE (11D: [Take a nibble of]) and STUFFED in the grid (27A: [Unable to eat another bite]). Along with the grid being tasty, it also has a bit of feistiness, with both TIFF (38A: [Squabble]) and SCRAP, at least if you think of the alternate definition of the latter (26D: [Metal to be recycled]). “Sports will make you smarter” moment of the day: HAHA (70A: [“Funny!”]) – Current National Football League football player Ha Ha Clinton-Dix is a safety who recently signed a one-year deal with the Chicago Bears this offseason. During his time at the University of Alabama, Clinton-Dix, whose given first name is Ha’Sean, won two national championships (2011, 2012) while being named a consensus All-America in 2013. Ha Ha was drafted by the Green Bay Packers in the first round of the 2014 NFL Draft and, in 2016, made the Pro Bowl while being named a Second Team All-Pro selection at safety. I don’t know how it’s possible, but baseball’s OPENING DAY is this Thursday. I really thought it was always in April. The revealer clue is 62a. 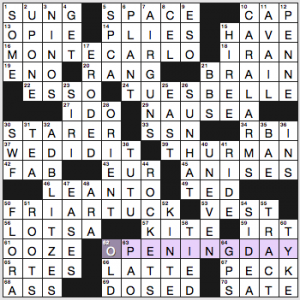 Start of the baseball season … or what the start of each starred clue is? ], and those seven answers start with three-letter abbrevs for the days of the week. We’ve got SUNG, MONTE CARLO, TU ES BELLE (a contrived French phrasal answer? ), WE DID IT, THURMAN, FRIAR TUCK, and SATE. Presumably it’s running Tuesday rather than Thursday because it’s an easy puzzle. Can ANISES really be plural? I hate it plenty in the singular. 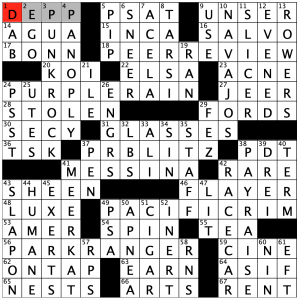 (As an herb and flavor, not as crossword fill.) Please don’t bring me multiple ANISES. Signing off early—3.25 stars from me. Good night! After a relaxing weekend of solving in ideal quiet circumstances, this puzzle was solved with a six-year-old making constant noise and several other distractions. That’s my story and I am sticking to it! 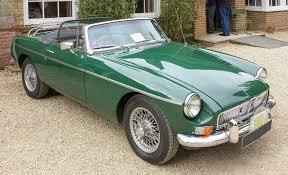 When I think of MG, I think of the car, but I’ll bet it was fun to brainstorm potential grid entries for this. Matt, missed you this weekend at the ACPT! You would have loved these puzzles!! 4.5 stars today. 16A [He wears the horizontal stripes] ERNIE – And Bert wears vertical ones! 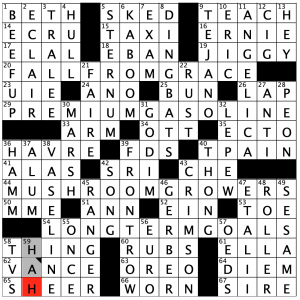 24A [“I guess that’s ___”] A NO – A great way to clue this that does not have the tilde controversy. 40A [He won “The Masked Singer” (sorry for the spoiler)] T-PAIN – You’re not spoiling it for me, since I didn’t watch one frame of this show. Trip Payne’s favorite singer! 61A [“Boo’d Up” singer Mai] ELLA – Will this singer become more famous than ELLA Fitzgerald? She is arguably more famous right now, at least in the R & B scene. The above song was, I believe, nominated for a Grammy in 2018. 62A [“Riptide” singer Joy] VANCE – I don’t know this song, even though it has 750 million plays on Spotify. (That’s a LOT, if you’re not familiar with Spotify.) I actually thought the singer was “Joy Vance”! 3D [Ireland’s ___ Bay] TRALEE – This is a little hard, but you should know it if you do crosswords. 10D [Carolina Panthers safety Reid] ERIC – This player was probably the most prominent NFL kneeler next to Colin Kaepernick, but he was on a roster at the end of last season. No matter your opinion on this, the way this played out was very interesting; Kaep got a settlement from the NFL. No one knows how much, but it was a chunk. 31D [Fizzle out] GO DIM – Gotta make sure this is in my word list!! 38D [Petroleum product and long-time pageant secret used on teeth (ew)] VASELINE – “Ew” is right! That is all! Another Jonesin’ coming next week. Great job on interlocking all of this in a 15×15 grid. I still don’t know who this constructor is, but I would like to meet whoever can make puzzles this good. 4.7 stars from me today. 16A [Loud salute] SALVO – I think of a flurry of bullets when I hear this word. Sometimes this is in the form of a 21-gun salute, I suppose. Those are gut-wrenchingly sad, if you’ve ever witnessed one, especially if it is someone you know. 22A [“Born Free” lioness] ELSA – I keep saying how old I am getting, but I remember watching this when I was younger. And no need to reference Disney! 41A [Sicilian seaport] MESSINA – I know of Loggins & MESSINA and also country singer Jo Dee MESSINA, but I didn’t know it was also a town. I learned something new today! 62A [Like much bar beer] ON TAP – I may have had a beer or two on tap from my annual trip to Dinosaur BBQ in Stamford! 4D [Impressive collection] PANOPLY – This is a great word. No one says it, but still a great word. Surely more commonly encountered while reading. 7D [Amtrak high-speed train] ACELA – Rode the train from Stamford to Harlem on Sunday, then rode a NYC city bus for the first time. Janie, thanks for the tips you gave my sister! And now that I have the trip down pay, they will likely move the tournament to somewhere else! My vote is for a Vegas hotel! 26D [Some MIT grads] ENGRS. – This is not the greatest abbreviation. There are so many letters that it isn’t that much shorter than the original 9-letter word! 42D [9-Across vehicle] RACE CAR – 9A referenced the UNSER family. The Indy 500 is still a big thing, and is on NBC this year for the first time, after literally decades on ABC. That might be weird. Hopefully it will have warmed up by then; it is nearly April and it is still only highs in the 40s here in northern Indiana! For my ACPT recap, I finished 74th or so with one error, on the last puzzle! Eliminate the error and I land in 55th with a trophy for 2nd Midwest, which I thought I could attain. Motivation for next year! 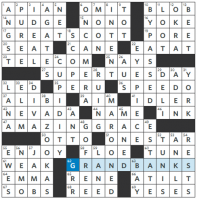 After getting to meet many of my crossword heroes this weekend at the American Crossword Puzzle Tournament, I’m excited to see which “Heroes” the Tuesday WSJ has in store for us! 17A: GREAT SCOTT [Florida senator Rick’s alter ego] – Not the greatest dude, so I was a bit bummed to see him in the grid. 27A: SUPER TUESDAY [Actress Weld’s alter ego] – A bit of a dated reference, but I like how modern/fresh the themer itself feels. 62A: GRAND BANKS [Model Tyra’s alter ego] – of Newfoundland, I think! Is this a debut puzzle? I don’t see the constructor’s name in the Fiend database anywhere so, if so, brava! What a great debut puzzle and a fun, straight-forward, consistent theme for a Tuesday. I appreciated not only getting to solve a puzzle from a woman constructor, but I enjoyed that 3 of the 4 theme entries were also women. And each woman is from a different era and profession – that will certainly allow most any solver to get some kind of foothold into the puzzle with one theme entry and maybe learn more (like I did!) about another one. I really enjoyed clues like [Sparks setting] for NEVADA (in reference to the town, not the Los Angeles Sparks WNBA team) and [Root for the chef] for BEET. I also learned in this puzzle that CUPIDITY means [Greed], which I’ve never really associated with Cupid; it turns out that the word might actually derive from covet instead, which would make more sense. Neat! Finally, can we talk about how clean the fill is in this puzzle?? When AUS and ELEM are the worst offenders I can find, it’s a pretty clean fill IMO. Nice! 9d [*Explores nosily (first word)] SNOOPS AROUND–First word, SNOOPS, read upward, is SPOONS, a card game. 21d [*Isn’t treated fairly (third word)] GETS A RAW DEAL–Third word is RAW, which, read upward, is WAR, a classic card game. 25a [*Beef entree (second word)] SIRLOIN TIPS–Second word TIPS, if read upward, is SPIT, a card game also known as Slam or Speed. Other fill that might be deemed noteworthy include SCOOP NECK, ANATHEMA, PRO FORMA, SO IT SEEMS, SHA NA NA. 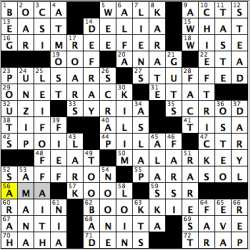 One item I did not like was BEGORRA–I’ve never known it, save for in crosswords. This entry was posted in Daily Puzzles and tagged C.C. Burnikel, Cheryl Phair, Elizabeth C. Gorski, Matt Jones, Parikshit S. Bhat, Paul Coulter, Zhouqin Burnikel. Bookmark the permalink. NYT: I like. Definitely packed and partway through solving I was wondering what could possible pull all this together. Still finished faster than yesterday. I also liked having THURMAN as a change from the vowel-friendly Uma. And for some reason LOTSA over OOZE made me laugh. That’s probably the caffeine talking. NYT. Nice but I only wish that SAT and SUN would have been in the downs. Universal: Really didn’t get this one today. Still am not seeing what the theme is all about, and DO-RAG clued as “Hip-hop headgear” is about as tone-deaf / blatantly-racist as a clue could get. The clues mislead you. The three down themers do not combine to reveal a three-word phrase/”game.” The words indicated in parentheses point to which part of the answer is read upwards to reveal a game. GETSA(RAW)DEAL = WAR. @CR Thank you for that. Took me a while to figure out what was going on. Sorry the DO-RAG clue rubbed you the wrong way, Marcus! I’ll be sure to research do-rag’s connotations before cluing it again.